Animal Defenders International (ADI) has met with Home Office officials and handed in a formal complaint concerning Nafovanny, a Vietnamese primate breeding supplier. ADI has also called for the immediate withdrawal of the licence enabling a dealer in Vietnam to supply monkeys to UK laboratories. Video footage shot by ADI investigators inside Nafovanny, Long Thanh, Vietnam – one of the largest suppliers of laboratory monkeys in the world – has revealed monkeys living in deplorable conditions. In one section of the monkey breeding facility, monkeys are living inside small rusting cages, barely a metre tall, little larger than one of the animals standing fully upright. Some cages are in a state of collapse and lean at different angles. The footage, filmed in November 2008, has caused acute embarrassment to the Home Office who three years ago threatened to withdraw the Nafovanny licence to supply monkeys to UK laboratories but were assured improvements had been made. In 2005 the UK’s Home Office stated “before primates can be acquired from an overseas breeding centre it is necessary for the Home Office to have appraised and accepted the use of that centre in order to ensure compliance with the section of the Home Office Code of Practice for the Housing and Care of Animals in designated Breeding and Supplying Establishments (1995 HC 125) pertaining to the import of primates” , and: “In effect we will only allow the use of animals from overseas centres we believe produce purpose-bred animals to acceptable welfare standards”. In March 2005 an inspection of the Nafovanny facility in Long Thanh identified, “shortcomings in animal accommodation and care” and the centre was notified that its “status as an approved centre would cease” once all existing orders for primates had been filled. By the end of 2005 however, the Home Office had received “reassurances and evidence that significant improvements had been made”, and concluded that Nafovanny could meet the required standard. Permission was given for them to continue to supply to the UK. The evidence upon which this decision was based, was “unedited video footage, photographs and reports”. The 2008 evidence that ADI have from Nafovanny would indicate that assertions of government control over standards of welfare at foreign suppliers are more of a public relations exercise, than enforcement of measures to uphold scientific standards and animal welfare. In the year up to June 2008, at least 476 monkeys were supplied by Nafovanny in Vietnam to Huntingdon Life Sciences (HLS) in the UK. 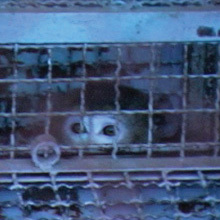 An ADI undercover investigation revealed how the Nafovanny monkeys would be flown to France than driven to HLS – a journey lasting 30 hours or more. At HLS the monkeys would be placed in stock colony JO6, a series of small windowless rooms run by a shadowy supplier Belgrave Services – who ADI have also asked the Home Office to investigate. ADI says the Nafovanny footage shows just how hollow such claims are. ADI also filmed the monkeys being used in horrific experiments at HLS which included severe restraint and being forced to inhale new drugs. In one test monkeys collapsed with blackened lungs and died or were killed. In another test a monkey almost chewed his finger off. The Home Office inspectors had in fact visited Nafovanny just months before our team and saw no problems. Officials have undertaken to look at our evidence and may visit Nafovanny later this year. They may also take action if a UK lab orders more monkeys from this breeding centre.